What is the Difference Between the Wonderlic Basic Skills Test and GAIN? One question we’re often asked is what is the difference between the Wonderlic Basic Skills Test (WBST) and the Wonderlic General Assessment of Instructional Needs (GAIN)®. While they both assess basic math and verbal skills, their purposes are very different. 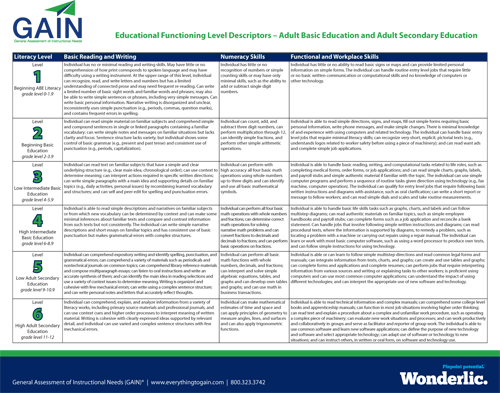 The General Assessment of Instructional Needs is approved for ABE programs by the U.S. Department of Education, and for WIA youth programs by the U.S. Department of Labor. It is designed to mirror the National Reporting System’s (NRS) Educational Functioning Levels. The test is 90-minutes long and measures both English and math skills. GAIN’s two forms can be used for pre, progress or post testing to show the degree of learning. GAIN scores are reported in terms of Educational Functioning Levels (EFLs) and, for programs that are required to report their scores for federal funding, they can be automatically uploaded to state databases that allow for the transfer of data over the web. The GAIN report shows more than just a student’s score. It provides specific diagnostics that help guide instruction. This report is used by teachers to pinpoint – very specifically – the strengths and weaknesses of their students. Instructors can use the report to create targeted instruction plans to help students reach their goals faster. Additionally, the report has proven to be a great motivator for students. They gain (no pun intended!) a clear understanding of their existing abilities and can see improvements over time. This gives them a more focused approach to their learning. The Wonderlic Basic Skills Test is designed to give a snapshot of an individual’s basic skills as they relate to work readiness and post secondary education. It consists of separate math and verbal tests, each 20-minutes in length, and is offered in both proctored and non-proctored versions. The WBST report is available either as a single or two page document. The single page report provides the overall test scores, along with a breakdown of scoring in the verbal and quantitative areas. The two page report also includes the scores, and adds detailed instructional needs on the second page. This report is perfect for educational institutions that need more information to help place students into the right classes. Unlike the GAIN Assessment, the Basic Skills Test is not designed to show educational gains over time as a progress or post test, and it does not provide scoring in terms of EFLs for NRS reporting. Which test would be most beneficial for you? What improvements do you think a basic skills assessment could bring to your school or organization?